Readers of all ages will delight in following Aisha and her family and friends as they celebrate eight pagan holidays over the course of a year. Told in Aisha's own words, these charming stories bring to life the beliefs, values and traditions of the pagan holidays as they are celebrated today. Each story is followed by discussion points and activities suited for adults and children and designed for family and group settings. Stafford includes simple instructions for common ritual practices like decorating an altar and casting and closing a circle as well as an introduction to each pagan holiday and suggested books, music and web sites. Educational and interactive, Aisha's Moonlit Walk is ideal for parents, RE teachers and anyone who wishes to celebrate the passing of the seasons in an earth-based spiritual way. What would our world be like if young people grew up knowing that Mother Nature teaches us everything we need to know? If they were taught how to tune their hearts to her rhythms would it make it easier for them to find their way in this life? 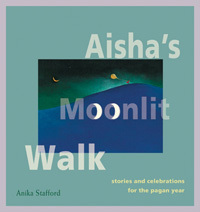 Aisha’s Moonlit Walk: Stories and Celebrations For the Pagan Year reminds us that the Old Ways embody truths that, if revived, could help us reclaim something precious. This wonderful book will show everyone who reads it how to bring joy, understanding, and meaning back into their life and into their family circle. The stories are a delightful way to experience what it's like to grow up in a pagan family. The guide for parents and teachers is a clear and easy-to-understand introduction to paganism. The "Things to Talk About" section at the end of each story will spark good discussions, and the activities are both meaningful and fun."